Throughout its global programming, SPRING is harnessing the power of innovative community media to improve maternal, infant, and young child nutrition (MIYCN) and hygiene practices. In addition to traditional communication channels and platforms, new low-cost technologies can be utilized to vastly reduce gaps in information for both rural and urban families trying to improve their health and livelihoods. In previously isolated villages, the introduction of mobile phones, low-cost video cameras, computers, editing software, and mobile pico projectors is opening the doors to an influx of information. When community members see and hear about people just like them who have tried and adopted new and improved behaviors to enhance their family’s health and wellbeing, the results can be powerful. We are using this novel social and behavior change communication approach to change lives by developing and promoting locally produced participatory media, including radio spots and videos. Our community media programming combines nutrition messaging with creative, community-based technology platforms. The community-based interpretation and rollout of the work ensures the local adaptation of messaging is appropriate and acceptabile, while the ongoing creative process ensures the tools can be adapted for evolving seasonal variation and potential environmental and other shocks. By promoting uptake of key MIYCN and hygiene practices while building local capacity to develop and disseminate contextually-appropriate, locally-relevant, and life-saving information, our media platforms help build resilience and healthy families in highly vulnerable settings. SPRING has engaged in community media programming in India, Niger, Burkina Faso, Senegal, Guinea, Ghana, and Uganda. Beginning in 2012, SPRING collaborated with Digital Green (DG) to test the feasibility of their innovative “human mediated digital learning approach” for the promotion of high impact maternal, infant and young child nutrition (MIYCN) and hygiene behaviors. We adapted this approach—which previously focused on the promotion of improved agricultural behaviors—to encourage better nutrition and hygiene practices in Keonjhar District of Odisha, India. In 2014, we refined the approach for the resilience context of Niger in partnership with three projects: the Resilience and Economic Growth in the Sahel – Enhanced Resilience Program (REGIS-ER), Livelihoods, Agriculture and Health Interventions in Action (LAHIA), and Sawki. We conducted a mixed methods evaluation of the approach to assess changes in MIYCN behaviors with exciting results further detailed in the Seeing Is Believing Report. As of April 2017, we have since scaled up the approach to 248 villages in two regions of Niger and adapted the approach for Burkina Faso, Guinea, and Senegal. In the most underserved areas of Burkina Faso, SPRING and its partner, Development Media International (DMI), are training community radio and theatre groups to promote better maternal, infant and young child feeding and hygiene practices. A third partner in this effort is Resilience and Economic Growth in the Sahel – Enhanced Resilience Program (REGIS-ER), which works across both Niger and Burkina Faso in the Sahel. The work in Burkina Faso uses radio spots, complementary live dramas with local actors, and existing radio listening groups while also developing the capacity of the radio stations. 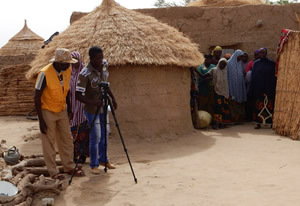 Using community-led videos to transform attitudes and practices in the African Sahel. A local radio station attended a SPRING handwashing event in Thiokomaty village to capture messages for further radio promotion of good hygiene behaviors.